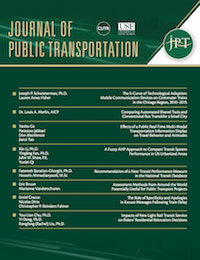 The Journal of Public Transportation is an international peer-reviewed open access journal containing original research and case studies associated with various forms of public transportation and related transportation and policy issues. Topics are approached from a variety of academic disciplines, including engineering, planning, economics, geography, public policy, political science, and others, and include policy, methodological, technological, and financial aspects. Emphasis is placed on the identification of innovative solutions to complex public transportation problems.